Since Civil 3D’s first release people (including myself) have struggled to make a comparison between it and its predecessor Land Desktop. Making such comparisons are only natural as we have each used Land Desktop for some time and ultimately understand the way it works. Now we are presented with this new platform and have been left with questions like where’s my Land Desktop Project, what about my prototype, etc? While the help files have done a great job documenting the individual features of Civil 3D, a document comparing the two and explaining certain equivalencies has never existed. Well that is until AutoCAD Civil 3D 2008. 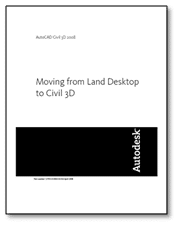 Arguably the most valuable new feature in AutoCAD Civil 3D, the new “Moving from Land Desktop to Civil 3D” users guide helps anyone trying to equate a feature in Land Desktop to our new friend Civil 3D. What I find most valuable about the document is that it is written from a collection of real-world experiences. For instance at one point in the document it discusses the topic “Increase Design Alternatives”. I must say I chuckled a little as I read that and thought back to my first Civil 3D lot layout project. With Civil 3D I was able to do in one day what could have easily taken two or three days to do in Land Desktop. One may concede I then had two days to go and work on another project – wrong. In the end I still spent three days working on the lot layout, the big difference was rather than having only a single lot layout to show the client we had three solid alternatives for him to choose from. But I digress. The “Moving from Land Desktop to Civil 3D’ really does do a great job establishing the mental link between Land Desktop and Civil 3D. Titled “Comparing Land Desktop and Civil 3D”, Chapter 2 actually provides a comprehensive side-by-side comparison between the two software platforms. Below is an excerpt from the “Grading” portion of chapter 2 illustrating the differences in terminology between Land Desktop and Civil 3D. In all the new users guide is 132 pages, and truly provides a detailed and upfront look at what’s involved in migrating to Civil 3D. For instance the document is rather candid about the fact you may want to hire a consultant to either develop or help you develop your style library. The vast differences in the fluid Civil 3D design environment and very linear Land Desktop design environment can be overwhelming for both CAD managers and users. Of course even if you have already migrated to Civil 3D, the user’s guide really does include a number of helpful tips that are likely to prove helpful for even the seasoned pro. Steve – It is included with the installation of Civil 3D 2008, although Autodesk has also made it available from their website. Where can I get this document?